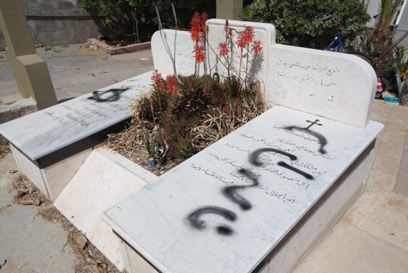 JERUSALEM — Attackers desecrated graves in an Arab Christian cemetery in Jaffa and damaged property nearby, in an incident that bore the hallmarks of a “price tag” hate crime, Israeli police said on Thursday. The attack sparked a sharp condemnation from the Council of Religious Institutions of the Holy Land, which said it was “incensed” by the vandalism. Police spokesman Micky Rosenfeld said that headstones in the Orthodox Christian graveyard in Jaffa, a mixed Arab-Jewish area in southern Tel Aviv, were sprayed with Hebrew graffiti and the tyres of five vehicles parked nearby were slashed. “Apparently the incident took place overnight,” he told AFP, saying the attackers had daubed “price tag” and revenge” at the site. “Price tag” is the term given extremist hate crimes which generally target Arabs. Initially carried out against Palestinians in retaliation for state moves to dismantle unauthorised settler outposts, such attacks have become a much broader phenomenon unrelated to any anti-settlement moves. They tend to involve the vandalism or destruction of property and have included arson attacks on cars, mosques and olive trees. In a statement, the Council of Religious Institutions of the Holy Land, which groups the Chief Rabbinate of Israel, Palestinian Authority’s ministry of Waqf and religious affairs, and top church leaders, said it was “incensed” by the attack on the cemetery. “Acts of graffiti not only offend the sensitivities of the communities whose sites have been desecrated but also those whose symbols have been misused to commit the hateful act,” the group said in a statement. A police official on Wednesday told a parliamentary committee that in 2012 they had opened 623 files on “price tag” incidents, arrested 200 people and served 123 indictments in connection with such attacks. Superintendant Galit Ziv told the Knesset’s interior committee that this year, police had opened 165 files on “price tag” incidents, arrested 76 suspects and served 31 indictments. Police considered ideologically-motivated “nationalistic crimes” as a top priority, she said. She did not say if any of the indictments resulted in a conviction. Two weeks ago anti-Christian graffiti was daubed on the Church of the Dormition, one of Jerusalem’s leading pilgrimage sites. Police said they suspected Jewish religious extremists of spraying the Hebrew-language insults at the site, where tradition says the Virgin Mary died.